I wanted to show Snoopy my undying love and amaze the neighborhood kids by making them sno cones all summer long. My parents did not see the value in the Snoopy Sno Cone Machine. At least, they didn’t value it enough to buy it brand new. But they did find one at a yard sale and bring it home. Unfortunately the blades were kind of broken and bent and there weren’t any flavor packets or the neat squeeze bottle to pour the flavoring on. When I tried to use it I just made smaller lumps of ice that just tasted like, you know, water. I did put some food coloring on some, but all that did was turn my lips blue. I abandoned Snoopy and went on to bigger and better things to impress my friends (I believe a travel record player in a suitcase was involved). While I was shopping last Christmas I found a whole row of Snoopy Sno Cone Machines, and I knew I my kids had to have one. The box said it was “The Original.” It seemed like fate. My kids could have the Sno Cone Machine that I never did and we they could impress the neighborhood kids all summer long. But the box also said, “New and Improved” so it was a little confusing. I decided to ignore that part though, because, how could you improve on such a classic toy? And it looked exactly like the one in the commercial from when I was a kid. So I bought one and gave it to Number 5. I don’t know if the satisfaction of having one was enough or not, but for some reason, I we didn’t try it out until today. It was beautiful out and the neighborhood kids were over. I suggested they try out the Snoopy Sno Cone Machine and watched with bated excitement. As luck would have it, they were having trouble putting it together, so I had to step in to help. To start, we had to make the flavoring, because of course it came with a flavor packet! Fruit punch. The instructions said to mix the packet with 2 quarts of water. 2 quarts! I wasn’t planning on making sno cones for an entire circus. Plus, the handy-dandy squirt bottle for the flavoring didn’t even hold a cup of the flavoring. What were they thinking? So we took a cup of water and just mixed in the powder until we liked the flavor. Then we needed to simply turn the crank and grind the ice. Sounds simple, right? Well, none of the kids could get the crank to turn. I could get it to turn, but it was hard and the handle would pop off about every 3 revolutions. We had just put the garden in this morning, and my biceps were already sore. 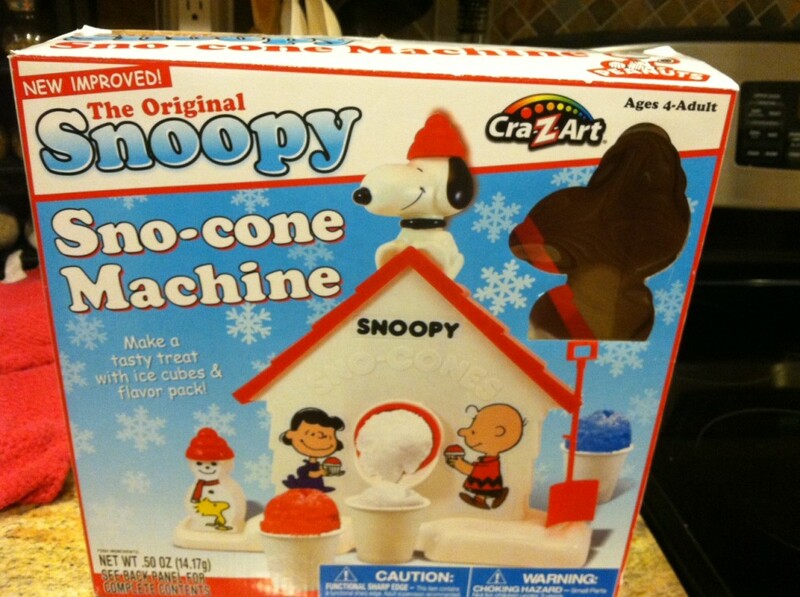 I wasn’t really feeling the Snoopy Sno Cone Machine work-out. It took about 20 minutes of turning the crank and putting it back together every 3 turns before we had shaved enough ice for everyone. The box came with 3 sno cone cups. Three, tres, drei, trois, eethray – no matter which language you say it in, 3 sno cone cups is not enough for the neighborhood kids, nor does it even come close enough to using 2 quarts of flavoring! Seriously, it looked like a Common Core problem when you tried to figure it out. So I gave the “specially-designed” sno cone cups to my 3 favorite kids (no they weren’t all mine) and doomed the rest to second-class citizenry with some other cups we had lying around. I have to admit, the ice was shaved extremely fine. It was pristine white and looked perfect sitting in the cups. Until we put the flavoring on. It was so fine, that the flavoring instantly began to melt the ice into watered-down fruit punch drink. 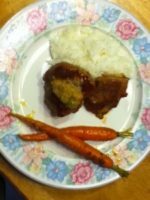 Yummy, Snoopy. I hate you Snoopy. Moral of the story – If you buy your kids something that you wanted when you were a kid, it will probably end up in THAT closet. You know, the closet where you store all the hideous toys you hope they never ask to use again.